I blame Mario Dedivanovic for this craze. In case you don’t know who Mario is, but you know who Kim Kardashian is, he is the mastermind behind Kim’s flawless face and the one who gave away the secret of the uniquely bright undereye triangle. Worry no more the industry said, and thus the banana powder was born. 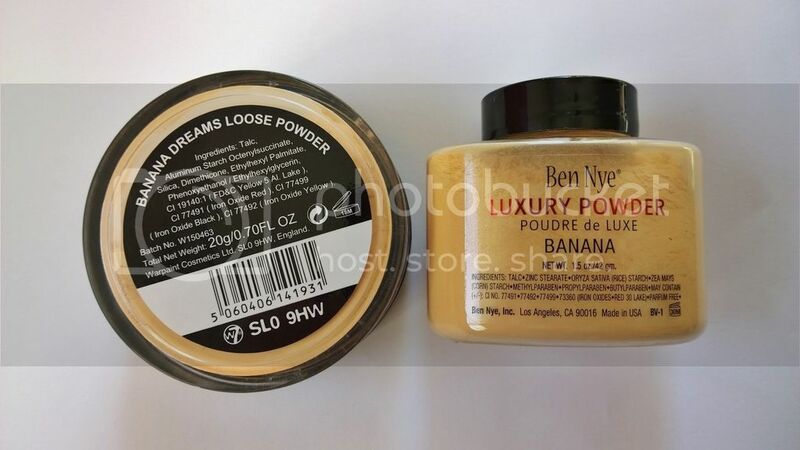 First there was Ben Nye, with the infamous (due to Mario) Luxury Banana Powder and then everyone else followed with their versions of this revolutionary powder that everyone seemed to go bananas over. Pun intended. 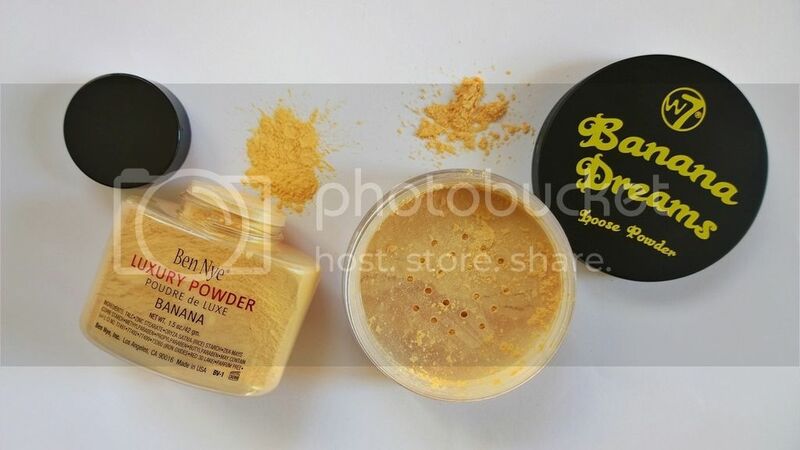 I am comparing the big mama with the not so famous W7 Banana Dreams Loose Powder, but I should mention that a lot of other companies have their own banana loose (or compact) powder that usually goes under the name of “Color Correcting Yellow Powder”. MAC makes one, NYX makes one, E.L.F. makes one, Inglot, Smashbox etc. Let’s take a moment here to talk about color correcting for a minute. b) Orange or Salmon tone concealers/creams to hide dark circles (or 5 o’clock shadows). 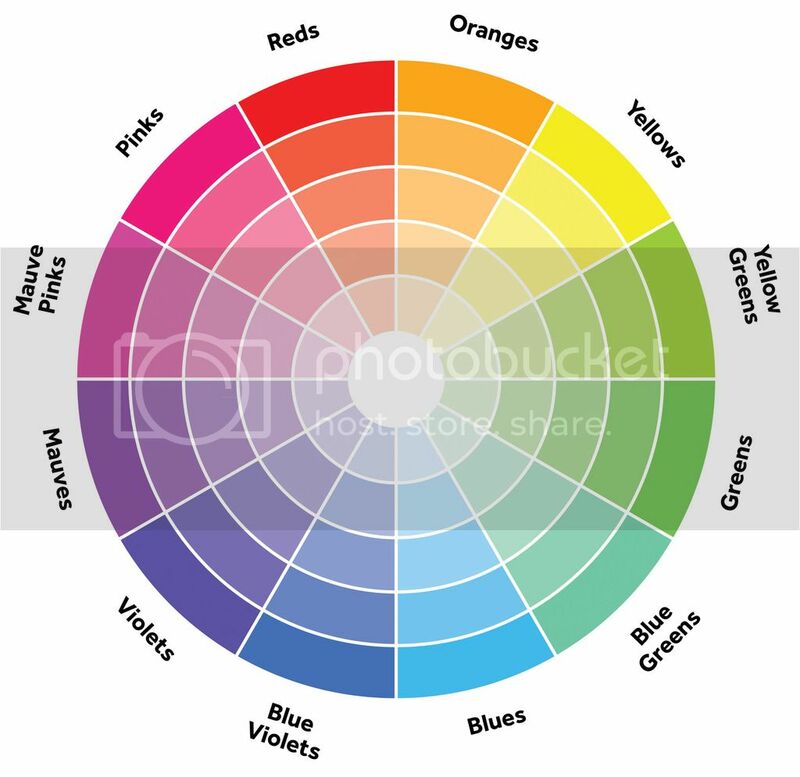 c) Lavender (primers, concealers, powders) to bring life to dull yellowish areas. 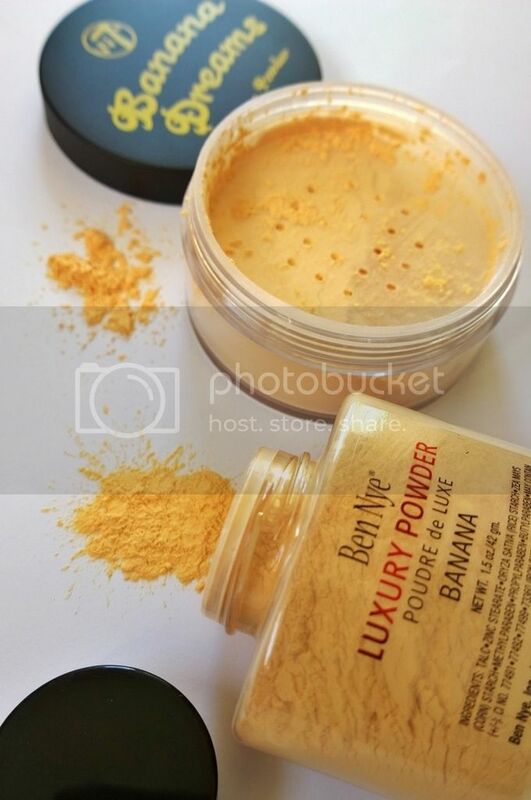 d) Yellow (concealers and powders) to brighten the center of the face and the undereye area. Color correcting mini lesson over. Let’s move on to banana. As far as the color of the powder is concerned, those two are not too far apart. A very trained eye might notice a slight difference in tone, but the overall color is pretty much the same. Both yellow, both banana, both loose. Good so far. As far as application goes, I didn’t notice much of a difference. They are both really smooth, velvety feeling, finely milled and not cakey. Meaning they are both very good quality powders. The differences are slight, but important so let’s take a closer look. Going through the ingredient list the first thing that catches my eye is the fact that the W7 contains Silica. Silica, in its mineral form is a chemical compound that is used in makeup a lot, thanks to its versatility. Not only does it help with oil control, due to its ability to absorb several times its weight, but it feels comfortable and light on the skin AND it has proven to blur fine lines and pores. For those who worry about white casts with flash photography, this powder won’t create any problems. It passed the test easily. 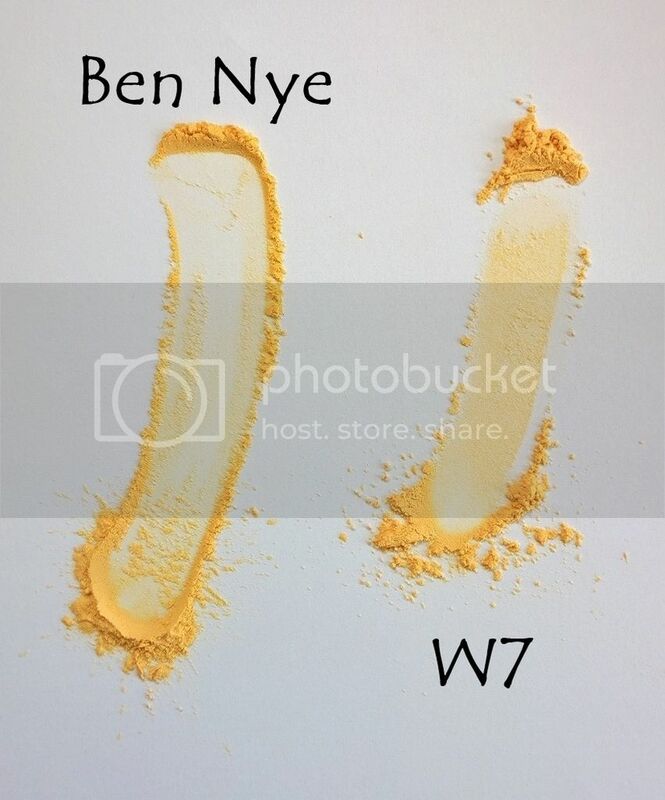 Plus, looking at them swatched next to each other, you can see that the silica makes the W7 a little more buttery than the Ben Nye. But overall, not dissimilar. The last thing that there is to compare is the price/quantity. The Ben Nye 1,5 oz (aka 42 g) jar retails for $15. I bought the 0,70 oz (or 20g) jar for 7€. So basically, not much difference there either. Is there a bottomline to this whole story? Well yes. Silica aside, these two are very very VERY similar products. If you live somewhere in the world where you do not have easy access to Ben Nye products, the W7 is a great alternative.